TOKYO -- Honda Motor Co. today said its October-December net profit more than doubled to 160.7 billion yen ($1.56 billion), back to pre-Lehman crisis levels, helped by strong sales of the redesigned Fit subcompact that went on sale in Japan in September. Honda cut its vehicle sales forecasts for this fiscal year as slumping demand in Thailand overshadows what has otherwise been a golden year for Japanese corporate earnings, which have benefited from the weaker yen. Honda lowered its full-year sales projections for vehicles and motorcycles by about 1 percent. The company now expects to deliver 4.385 million automobiles and 17.32 million motorcycles in the financial year ending March 31. It said it aims to sell a record 4.5 million vehicles or more in its 2014 financial year. The slump in Thailand, where Honda saw deliveries plunge last quarter, will probably continue because of the political turmoil there, Honda said. "Every Japanese carmaker was hurt in Thailand, and so was Honda," said Kota Yuzawa, an analyst at Goldman Sachs Group in Tokyo. "Honda hasn't launched its new hit products in the region so we'll have to wait until next year to see a pickup in volumes." 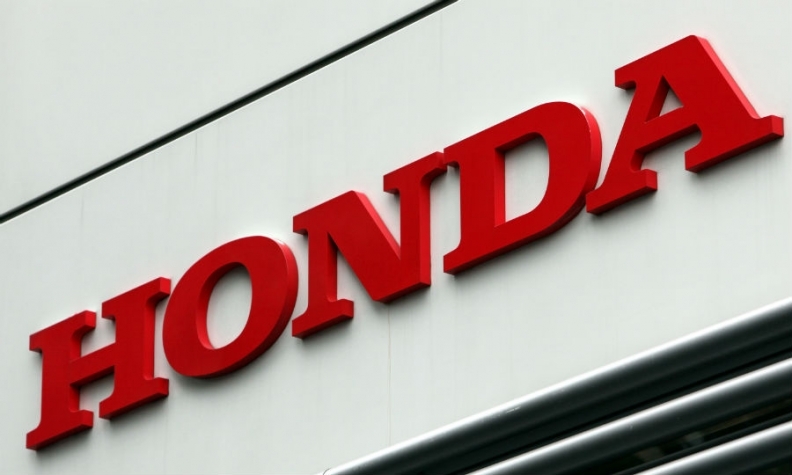 For the year ending in March 2014, Honda stuck to its forecast of 580 billion yen in net profit. CEO Takanobu Ito has set an aggressive goal of selling 6 million vehicles a year by end-March 2017, compared with a record 4.01 million in the year ended March 2013. In North America, Honda reaped 131.1 billion yen in operating profit last quarter, increasing from 70.89 billion yen a year earlier. Honda expects to sell a record 1.6 million cars in the United States, its biggest market, this calendar year ending March 31, up 5 percent from 1.525 million sold in 2013, Tetsuo Iwamura, executive vice president in charge of the automaker's U.S. business said today. Honda showed a retooled Fit at the Detroit auto show this month that will be sold in North America starting this year. The company is counting on the model to grab market share from the Chevrolet Sonic and Ford Fiesta. Iwamura said in an interview in December that fixing Acura's sedan lineup has become a top priority. The company showed the new TLX sedan, a replacement for the TL, at the Detroit auto show this month. Operating profit rose 46 percent to 59.3 billion yen in Japan, as deliveries jumped in the quarter, helped by the new Fit and the rush buying before the sales tax rise in April. The Fit, introduced Sept. 6, became Japan's top-selling car from October through December, overtaking Toyota's Aqua. In China, Honda's sales doubled last quarter, as a consumer backlash eased over a territorial dispute between Japan and China. Full-year China deliveries rose to a record, fueled by the Jade wagon and Crider sedan, which Honda says are the company's first models tailored for the Chinese market. Industrywide sales are projected to expand by as much as 10 percent this year, after the country became the first to surpass 20 million units in annual deliveries, according to the China Association of Automobile Manufacturers. Honda expects sales to rise at least 19 percent to more than 900,000 vehicles in China in 2014. The carmaker plans to introduce nine new or revamped models in 2014 and 2015, as it seeks to catch up with Nissan and Toyota in the world's largest auto market. Honda's quarterly operating loss in Europe widened to 8.7 billion yen. Honda is among Japanese exporters benefiting from Prime Minister Shinzo Abe's economic policies, which have helped weaken the country's currency by about 18 percent against the dollar in 2013. A weaker yen increases the value of repatriated earnings and gives Japanese carmakers an edge over rivals including General Motors Co. and Hyundai Motor Co.
Before Abe, the Japanese currency had hobbled exporters for years, appreciating to a postwar high of 75.35 to the dollar in October 2011 from about 115 in a four-year period. Honda is the first of Japan's big three automakers to announce quarterly results. Toyota will report results on February 4 and Nissan on February 10.